Really pleased with climbing progress today. Finally managed to get out a tricky move on part of the 'Squares' traverse: a Dynamic from an awkward hold down to a right foot hold a loooonnnnnng way away! In the piccy (stolen from UKclimbing) the right foot is stretched far out, and then there is a right-hand grab for another far-away hold. 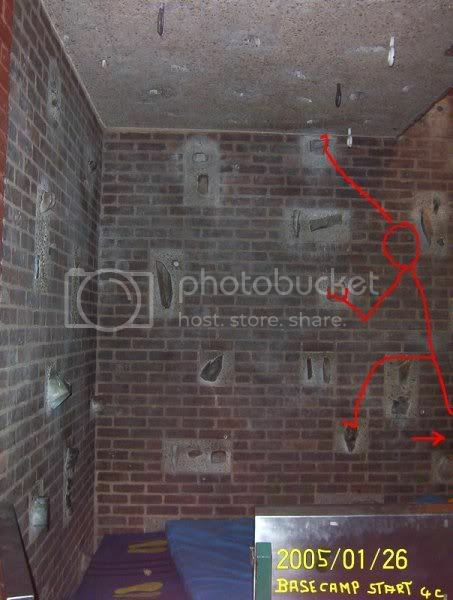 I found a route map for the wall today, with a nice route "up and over" the chimney at the right - that's next!